Authors: P.-Y. Meslin, O. Gasnault, O. Forni, S. Schroder, A. Cousin, G. Berger, S. M. Clegg, et al. 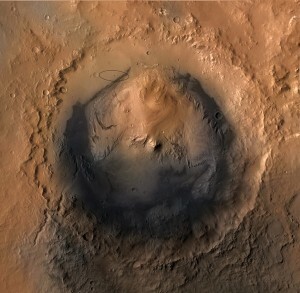 Figure 1 – Gale Crater on Mars, the landing site of the Curiosity Rover. The Curiosity rover has been roaming the Gale Crater on Mars since last summer. The ChemCam instrument on Curiosity has been precisely analyzing the martian soil. This week in Science Magazine, the Curiosity team announced they found hydrogen in the soil, which is linked to the presence of water. Analysis with ChemCam begins with a laser being fired into the soil or rock to be studied. The laser melts the sample into a plasma, and the spectrometer picks up the emission lines. The ChemCam laser is capable of sampling an extremely small area (350-500 micrometers). This allows it to isolate different soil components, an improvement over bulk processing. Each laser shot digs deeper into the soil or rock, so it can measure variability with depth. 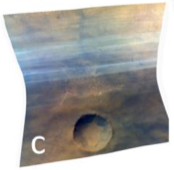 ChemCam can measure both the spatial and temporal variability of hydrogen in the martian soil. This analysis has been done with 3600 spectra taken in just the first 90 days. 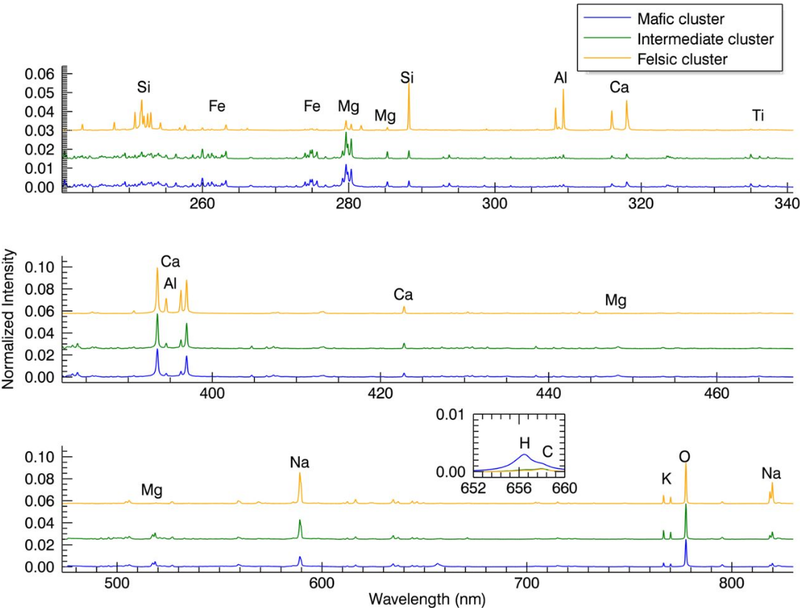 Three clear soil groups were found in the data: a mafic type (a silicate mineral rich in magnesium and iron), a felsic type (a very different mineral enriched in lighter elements, e.g. granite), and an intermediate type. All the fine grain mafic samples show a hydrogen peak in the spectra. There are a few possible carriers for the hydrogen suggested in the paper: 1) Absorbed atmospheric H2O, 2) Hydrated crystalline silicates, such as phyllosilicates and salts, or 3) amorphous phases. The first two possibilities are excluded through further measurements. Three experiments were performed to look for variability of the hydrogen in the soil. First they looked for changes due to the day/night cycle by measuring the soil in the same spot during different times of day. Next they measurement variability at different depths by continuing to fire the laser in the same spot. Lastly, they searched for variability over a period of 11 days to soil freshly exposed to the atmosphere. None of these experiments revealed any significant variability. Any variability is either to small to measure or occurs over longer timescales than measured. ChemCam found hydrogen was ubiquitous in the mafic soil, which is representative of soil found all over the surface of Mars. The hydrogen, which indicates the presence of water, is found not only on the surface, but also at all the depths explored by the ChemCam laser. This hydrogen, likely carried by amorphous phases, could account for a large fraction of the water seen in orbital measurements. Figure 2 – Spectra of the three soil types analyzed by ChemCam. The inset in the bottom panel shows a close up of the hydrogen detection in the mafic group.